Cirsium muticum. Dan Busenmeyer Illinois Natural History Survey.www. inhs.illinois.edu. (Accessed 5/2014). 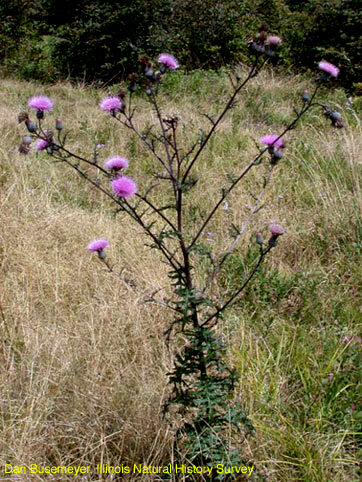 Cirsium muticum is a coarse biennial herb, 0.5-2 m tall from branched roots, stems branching, soft, hollow, young stems webby-hairy. Leaves alternate, basal rosette leaves stalked, stem leaves stalkless, blade to 55 cm long, 20 cm wide, pinnately lobed and toothed, thin, often pale webby-hairy below, margin weakly spiny. Flowers pink to purple, all tubular, in heads 2-3.5 cm long, bracts in several rows, webby-hairy, sticky, spine tip vestigial; blooms July-Oct.
Fruit 1-seeded achene 0.5 cm long, plumed. Habitat: Marshes, wet woods, thickets.